Sails / Products - Cruising Only Sails - Kent Sail Co.
Cruising sails are generally made from Dacron sail cloth - the most durable sail cloth. 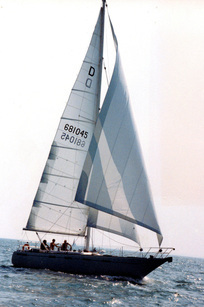 Cruising sailors typically have a mainsail made with either standard or full battens. They usually have a furling headsail w/cover on the trailing edge and bottom so that it can be rolled up on the forestay for easy storage. Some cruising sailors opt to carry a cruising spinnaker. These are attached to the forestay at the tack and controlled with a line which runs to the cockpit. This controls the height of the sail - no pole is needed. You can add a dowser to the sail which will easily snuff the spinnaker down when needed. The bonus sail for light air sailing. 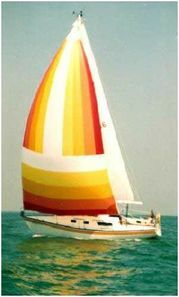 The sail attaches to the forstay so that it flies more like a genoa - thereby eliminating the skill and crew needed for spinnaker pole handling. Add a dowser for even easier launching and snuffing. The most popular sail for cruising sailors because it eliminates headsail changes. The sail is designed with built-in cover rolls on the headstay for improved storage. 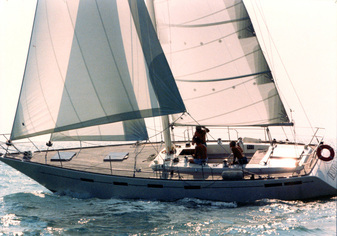 Modern furling systems allow sail size reductions for changing wind conditions.